I love to read and write poems with my girls and they love it, too! We have been trying out all different kinds of poetry forms, and for the most part, I take dictation while they compose their poetic masterpieces. There is just something satisfying about putting a few simple words together and creating an awesome poem! The first poems we wrote together were simple list poems – kids as young as three and four can have great success with this type of dictation! 1. 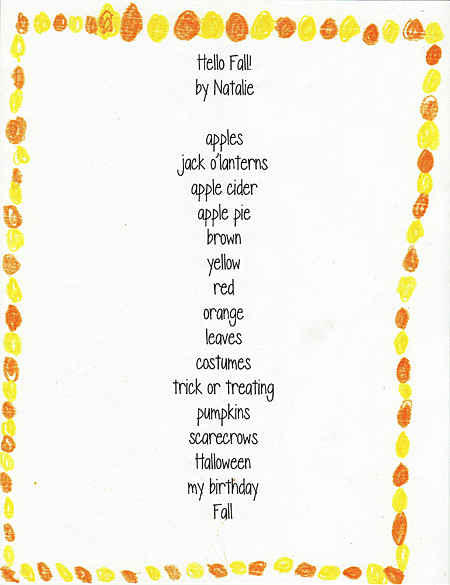 Help your child choose something to write about – it could be a favorite color, an animal, a place, a person, a holiday, etc. Whatever your child is interested in will work! 2. Ask your child to tell you everything he can think of that tells about the topic. If he gets stuck, ask a few questions like, “What does it look like?” or “What do you like about it?” You will be taking dictation, writing down everything your child comes up with in list form – one idea per line. 3. When your child says “Done!” or can’t think of anything else, read it back. 4. Illustrate your poem and start your own poetry collection! We recently found this great book of poems at our library – Falling Down the Page: A Book of List Poems . It’s a great one that my girls thoroughly enjoyed. What wonderful pieces to collect. Such a special way to record and preserve your children’s thoughts. My little girl recently turned three and we are certainly going to have a go at a list poem. She could talk endlessly about fairies, so I think we may start with this topic. The book you mentioned sounds like fun and would be a good source of inspiration. I will let you know when we complete our first ever list poem. Thank you for reminding me about how easy poetry can be. This is a great idea and not intimidating for the littler ones! Thanks! Great idea! Gotta ask….what font did you use to type your poems? Have a great day! Thanks so much for this great idea. 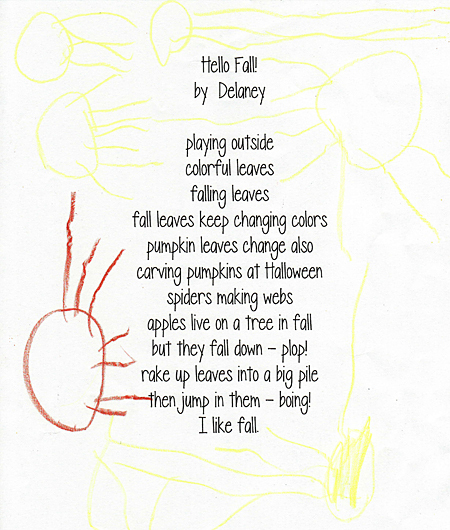 We just set up our first nature table so our fall poem was proudly displayed above it. I think this will be something that sneaks into our weeks frequently! Such an easy addition to add to our homeschooling lessons. What a wonderful idea! We will try this soon. Thanks! I was also wondering what font you used. We are going to work on our poem today!! awwwwwwwwww i love when little kids write poems!